Replace your old or damaged MIG Thickness Gauge scales. This replacement scale set works with the new MG1500 (yellow label) as well as the previous model (red label). Glass-Chek ELITE The Best Glass Replacement Tool On The Market Now Detecting Laminated Glass! The Glass-Chek ELITE is suited perfectly for glass replacement, but it's perfect for many other applications as well. 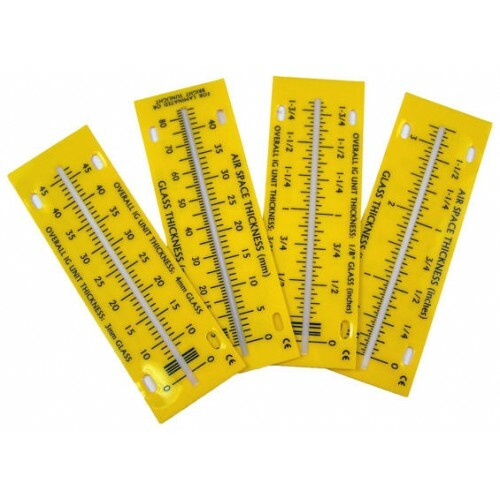 Whether you're instal..
"MIG" Laser Glass Thickness Gauge The "MIG" Laser Glass Thickness Gauge is a durable tool used to measure glass and air space thickness in sealed insulating glass units. Laser reflections off the surfaces of glass appear on the graduated scale of th..
UPGRADE OF MODEL #GC3000 TO THE MODEL # GC3001 -- Glass Replacement Made Easy -- With one push of a button, the Glass-Chek PRO tells you the exact replacement IG unit to order! The Glass-Chek PRO is suited perfectly for glass replacement, but..
GLASS-CHEK + Digital Glass Thickness Meterwith Single Pane Low-E Sensor Double Pane Thickness Measurement:Measure glass, air space and overall IG thickness of double pane windows - all at the single push of a button. The GC2001 works with sin..